Tresaith is a tiny village on the Cardigan Bay coast, known for its lovely sandy beach. Popular with locals and holidaymakers alike, it is an excellent spot for dolphin spotting while relaxing at the café or pub. It is an easy walk along the Wales Coast Path from Aberporth to the south and Penbryn to the north. When the sea is calm and particularly at high tide, it is great for swimming. At other times there is excellent surf - sometimes up to 2 metres high on a good day, and for those who don't want to submerge themselves, fascinating rock pools exposed at low tide will amuse you during your wanderings across the beach. You can also take a freshwater shower under a stream which cascades over the cliff into the sea. The sandy beach is a great place for days out with the whole family and part of it is dog friendly. 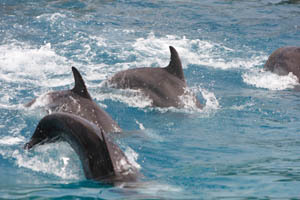 For those adventurous souls wishing to go beyond the breakers, numerous boats will take you to a close-up encounter with the Bottlenose Dolphins and Porpoises that abound. 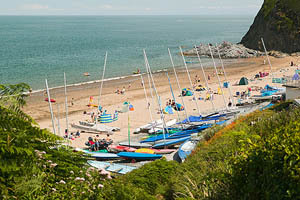 There is an active sailing club here, the Tresaith Mariners, with a mixed fleet of dinghies and catamarans. Visiting sailors are welcome to join in. Racing takes place on most Sundays throughout the season, with a safety boat on hand. To keep a beady eye on all that is going on in total comfort there is a splendid beachside pub/restaurant with an extensive outside terrace overlooking the entire beach. Refreshment is also available from the beach front café. The village is redolent with myth. "Saith" means seven in Welsh and legend has it that an Irish king had such a number of daughters who were so difficult to control that he finally set them adrift in an open boat. The currents of the Irish Sea brought the craft to Tresaith where the girls proceeded to fall in love with the sons of seven local Welsh families, married them and settled down. It should be added that no princesses have been seen recently. The village itself is of recent origin as until the mid 19th century it consisted of two dwellings: a thatched cottage and a pub. Then it suddenly became a popular resort - even being referred to locally as the Second Brighton. With Aberporth and Penbryn as its neighbours, Tresaith is one of three enchanting beaches on a short stretch of the Cardigan Bay coast. 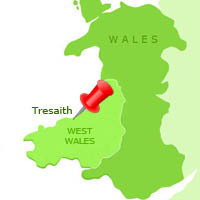 Looking for somewhere to stay in Tresaith? 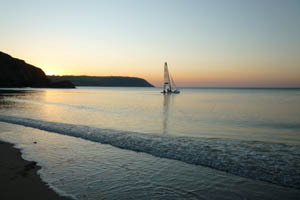 See holiday cottages in Tresaith.